I drink tea like some people drink coffee. It's a vice of mine that there could be sitting in various places in the house at any given time, 3 to 4 mugs with maybe a quarter inch of tea left in them. I was drinking tea and got up to do something and forgot where I put the mug. I used to joke that I could tell exactly where Carole had gone when she came home from school by following what I called "the debris field" of discarded shoes, coats, backpacks and other stuff. Well, the same could be said of me and my tea mugs. "Now where did I put that?" is not limited to items but to the last mug I was drinking. "Meh," I shrug. "I'll just make more." 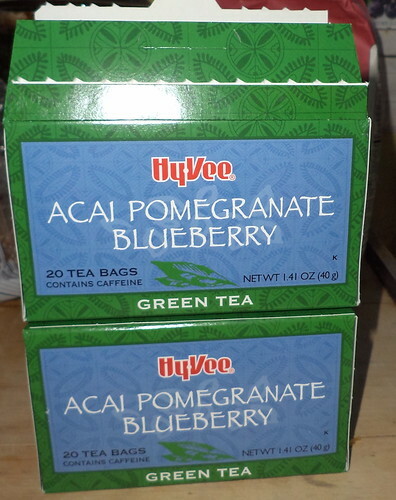 When I went to visit Patt in May, she found a tea she thought I would like. I'm usually not a fruit tea drinker. I love those richly roasted and oxidized kinds like English, Irish or Scottish breakfast. I don't care for green tea. To me, it tastes like steeped grass clippings. Celestial Seasonings and their herbal teas are cute but I'm not that interested in drinking bark or flowers. After I arrived, Patt made a nice hot mug of this and wow. First of all, it smelled so good. Second, it's a dark, rich, color and that is attractive to me. If I can read the paper through my tea, it's not strong enough. Lastly, it tastes good. It goes down smooth and is great to take with me onto the deck when I sit and watch life pass by. Patt sent me home with 2 boxes. So, when I found myself doing a lot of sitting last month, I found my taste for my usual teas waning. They were too strong. I just wanted a sipping tea, nothing demanding my attention, but something with a great smell and a smooth taste. I hadn't made any of this since mid-June, but I pulled out a bag and made a cup. It was just what I needed. I could sit in the recliner, feet up, feeling sorry for myself, trying to convince a reluctant black cat that my lap was where she needed to sit, and enjoy tea. It became my go to tea. I find that, as much as I like to play World of Warcraft and raid with the guild with a hot cup of tea at hand, my usual teas can keep me wired long after I should be winding down for sleep. Not so with this. There's a lot of buzz around "acai" and "pomegranate" being fruits which will cure all. I don't know that I buy into that. What I do buy into is the flavor of this tea was just what I needed. Each box holds 20 tea bags. I have 24 total left. I'm back to drinking my usual teas but I won't walk away from this flavor. Fall is coming and it will be perfect for lazy Saturday or Sunday afternoons spent sitting in sunshine on the deck.